I’ve always loved sketching outside although it’s sometime difficult to make yourself stop and draw when you’re out on the hill walking. But it really is worth while as it gives you a chance to really take in your surroundings. 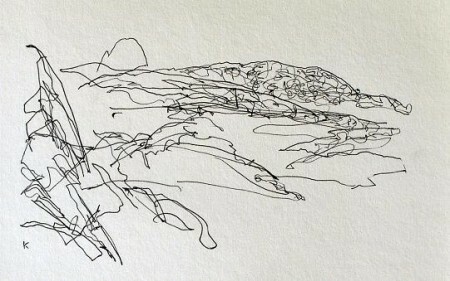 I did this little drawing last year when Anita and I were on holiday last May in Assynt. We were staying at the beautiful sandy bay of Achmelvich, just a few miles up the coast from Lochinver, and, as the weather was too poor for a day on the hill, we decided to follow the craggy coast south for a couple of miles. From any where along this coast the famous Assynt sky line grabs your attention – if of course the cloud is high. On this day, despite the gales, the famous Assynt peaks of Canisp and Suilven were clear and, at a sheltered spot I decided to sit for a short while and do some drawing. This quick little sketch was the result.